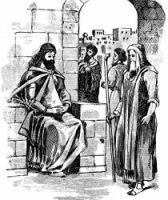 Absalom was the third son of David and Micah (or Maachah), daughter of Talmai king of Geshur, a Syrian district adjoining the northeast frontier of the Holy Land. Absalom had a sister, Tamar, who was violated by her half-brother Amnon. The natural avenger of such an outrage would be Tamar's full brother, Absalom. He brooded over the wrong for two years, waiting until the time should be ripe for his vengeance upon Amnon. Then trusting that everyon, even Amnon himself, would have forgotten the unhappy Tamar, Absalom prepared a feast and invited his father and all his brethren to his estate in Baalhazor, on the borders of Ephriam and Benjamin. Here he ordered his servants to murder Amnon, and then fled for safety to his grandfather's court at Geshur, where he remained for three years. At the end of that time he was brought back by an artiface of Joab. David, however, would not see Absalom for two more yers. Eventually, however, Joab brought about a reconciliation. Absalom then began at once to prepare for rebellion. He tried to supplant his father by courting popularity, standing in the gate of Jerusalm, and conversing with every suitor, and lamenting the difficulty which he would find in getting a hearing. He also maintained a splendid retinue and was admired for his personal beauty. It is probable, too, that the great tribe of Judah had taken some offence at David's government. Absalom raised the standard of revolt at Hebron, the old capital of Judah, now supplanted by Jerusalem. The revolt was at first completely successful. David was forced to flee from his capital over the Jordan to Mahanaim in Gilead, and Absalom occuped Jerusalem. At last, after being solemnly anointed king at Jerusalem, Absalom crossed the Jordan to attack his father, who by this time had rallied round him a considerable force. A decisive battle was fought in Gilead, in the wood of Ephraim, where Absalom was killed, even though David had hoped that his son's life might be spared. During his lifetime, Absalom had built a tomb in the king's dale, also know n as the valley of the Kedron, at the foot of Mount Olivet, near Jerusalem. This is where he probably expected to be buried, along with his three sons. 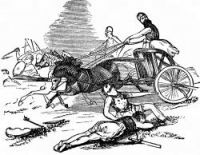 However, following his death, Absalom was buried in a great pit in the forest, and the conquerors threw stones over his grave, an old proof of bitter hostility. These illustrations of Absalom are from books in my collection. Feel free to use these drawings of Absalom in your artistic creations. Click on the Absalom pictures below to see more details about saving a free Absalom image or about purchasing Absalom art at a higher resolution.